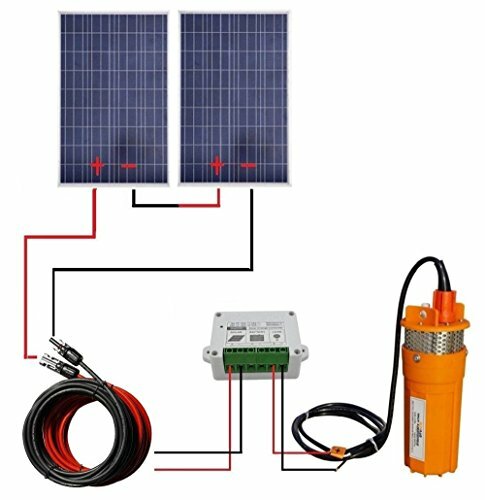 Solar Powered Water Pump -2x100W Poly Solar Panel w/24V Submersible Well Pump + Mounting Kit - 96 GPH | Fountain City Art Ctr. An all-in-one solution for your water pumping needs. The included solar panels will allow for easy hook up and power anywhere you need it, and with the compact and portable designs, you'll be able to use the pump in any well, pond, or water filled area you need to. Great for Ponds, Fountains, or anywhere you need running water. Hook it up to a 24V battery system and have constant pumping power, while keeping the battery charged using the included solar panels and charge controller(battery not included). View More In Solar & Wind Power. If you have any questions about this product by TrendSolar, contact us by completing and submitting the form below. If you are looking for a specif part number, please include it with your message.